I was brought up by the sea where we are spoiled for choice with affordable seafood of all kinds. I realized recently that I haven't eaten crab lobster in ages! 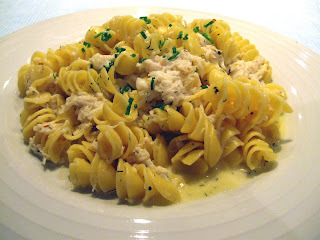 And how silly of me, canned crab is definitely affordable :) Does it have to be fresh to be good? Of course not. 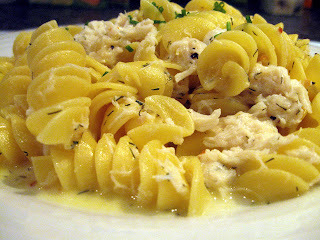 The canned crab tasted just as nice in the dish I made! Mmmmmm, Crab heaven! Or as my boyfriend would ironically say with his adorable accent 'CraP heaven' hahahaha...I don't think so! His english is perfect but he really needs to work on his B's and P's. hahaha! It's time for another Presto Pasta Night! I love reading the round-up every week. 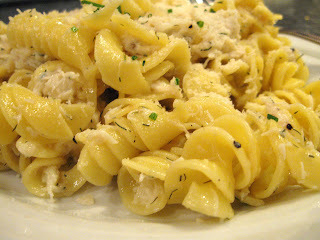 So many creative and delicious pasta dishes. Where will I ever find the time to try them all? This recipe was inspired by a really nice site I found called cdkitchen.com. I used the basic idea but adjusted a few measurements and added a few ingredients (lemon, chili, dill). - In a pan saute garlic with butter. Do not allow the garlic to brown. Add milk, pepper and chili flakes. Heat until bubbling (about 3 min). Add parmesan, dill and lemon juice. Heat again for about 1-2 minute, allowing the sauce to thicken slightly, then stir in crab meat and heat for a further couple minutes. It does sound heavenly. Thanks for sharing with Presto Pasta Nights. As for canned being good...most canning is done right after the catching...can't get fresher than that.